A visiting Rotuman dance troop aims to build reconnections with its history, community and youth in New Zealand. This week, Rako Pasefika held fundraisers and dance workshops and put on matinee shows for local South Auckland school children. Creative director Letila Mitchell said part of their mission was to also empower youth and share indigenous knowledge from elders both in Fiji and abroad. "It's a way for our urban international youth to connect back to the islands," Ms Mitchell said. "Also a lot of our elders who have moved internationally. "We have a huge base of elders here in Auckland and for us it is an opportunity for us to bring our young people to them and reconnect, learn stories. Because a lot of our arts and creative culture has died out, we have lost our tapa, our tattoos, a lot of our old dances have gone," she said. Ms Mitchell said they were also not afraid to produce new work that explored the impact of ongoing violence in their community. 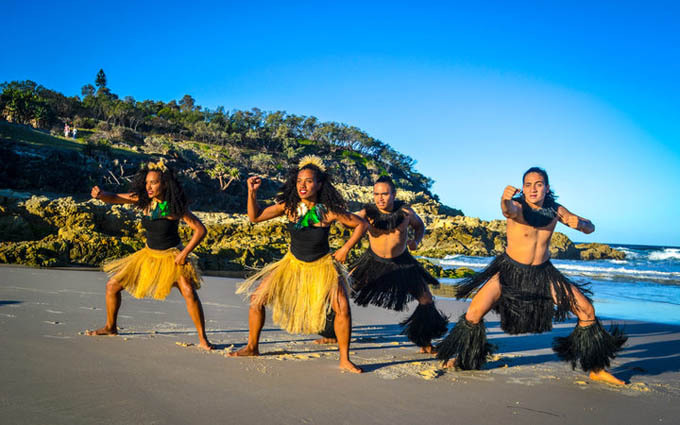 Rako Pasefika has its debut performance at the Pacific Dance Festival this weekend, entitled 'Cloaks of Protection'. An international Rotuman dance troupe is preparing to debut in New Zealand with a performance on the reawakening of culture and identity among women. The troupe, Rako Pasefika, has been working for at least five years on their show, 'Cloaks of Protection'. Spokesperson Samuela Taukave said the group utilised a contemporary island dance style. As well as the need to protect such things as the land and oceans, he said it also explored what might happen if cultural elements were not properly cared for. "It is uniquely Fijian and Rotuman, traditional and contemporary, because Rotuma is under the list of endangered cultures by the United Nations, so it is all the more special to us to be able to bring it over for the festival." The team is due to arrive in Auckland this weekend for their performance at the Pacific Dance Festival next week .